Sabbath Manifesto. Sounds intriguing doesn’t it? Once upon a time people weren’t constantly plugged into electronics. There were no personal home computers, cell phones, ipads, tweeting, email or the thousands of other devices and gadgets that today seem like a necessity. In fact many people practised a day of rest, every week! Before Sunday shopping became commonplace, back in the olden days known as the 1970′s. The National Day of Unplugging this year is from sundown Friday March 4th until sundown Saturday March 5th. A full 24 hours of not using electronics! It has been done! Last year was it’s inaugural year, and 2011 seems to be gaining steam. 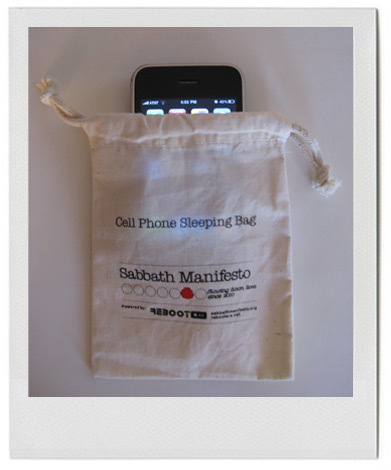 The site Sabbath Manifesto gives a top ten list of what to do instead of plugging in. Some simple things like drink wine, eat bread, go outside, light candles, connect with loves ones, give back, and of course avoid technology. Along with some other virtuous things like find silence, nurture your health and avoid commerce. What does unplugging have to do with the environment? Well everything really. When people are connected to nature, volunteer (give back) or practice better heath routines, de-stress and focus on simpler things the benefits will exponentially increase. Earth Hour encourages people to unplug for one hour of the day. This challenge asks if you can unplug for a full day. It will no doubt have a huge effect, not only on our overall electricity use, but on our collective psyche. Realise the simple necessities in life don’t require batteries, connect to an electric outlet or cost us money. These are the priceless treasures to be enjoyed and cherished. That is the tag line for EPIC the Vancouver Sun Sustainable living expo, on now at the New Vancouver convention centre. EPIC is in it’s third year. and I am volunteering at this incredible event for the third year as well. I will be blogging about it on my new blog, URBNblog and writing reviews of all the products I have bought, tested and tried at EPIC. So what does EPIC stand for? Ethical Progressive Intelligent Consumer. This is the place to try new and interesting products, and sample things you may have always wanted to. There are many contests and give aways, as well as great bargains. Fashion shows and cooking demos, speakers, and a chance for people to connect with the entrepreneurs who are driving the “green” movement in B.C , North America, and even Australia! This is a exposition and marketplace of ethical consumerism. If you already support fair trade, organic and high quality products this is an opportunity to get some great deals! I came across this wonderful Vegan Chocolate Cake recipe recently on my homeschooling message board. I have made it close to a dozen times already and each time it is perfect! It is so simple and really moist. Gather all your ingredients together first. Grease and flower your cake pans, I use two 8″ rounds or 24 muffin cups. Pour into greased pans and bake for 10 – 12 minutes depending on how hot your oven is. Remove from oven and let cool a few minuets before removing from pans, then let cool completely on wire racks. I always add a layer of jam between my two cakes, this makes them stick together, and my mom always did this so I do too. We know our food is being altered, who has not heard of Monsanto’s “round up ready” crops? Seeds that have been modified to grow despite being drenched in herbicide that kills every living green thing it touches. There is another product of the biotech industry that is commonly overlooked, GM cotton. Used not only for fabric, cotton seeds are processed into pulp for animal feed and cooking oil. Although health Canada assumes that refined oil from these crops raise no concerns related to safety, there are many that would argue the process of creating GM crops can create unpredicted damage in its DNA. These incedental changes could produce dangerous toxins, allergens or carcinogins, which if fat soluble, could end up in the oil and our food. Biotech companies. like big tabacco before them, believe we should assume these products are safe, and Health Canada agrees. According to the The Royal Society of Canada’s report it was found that “70 percent of the currently availalbe GM crops approved for commerce in Canada, including all the canola and cotton crops have not been subject to any actual lab or animal toxicity testing” The studies that have been done are not conducted by health Canada, but by the biotech companies themselves. Although more independent studies are needed some tests have shown animals fed GM crops showed profound changes in their livers, kidneys and hearts, and most alarming is the damage to the reproductive organs and DNA function. Even Monsanto’s own studies on trangenic corn MON863 showed toxicity in animals liver and kidneys. The only human feeding study on GM food, published in Nature in 2004, found that genes inserted into GM soybeans transfered into the DNA of human gut bacteria. The European Union has been fighting to ban all GMO crops and an import ban has been argued by the U.S. that this is in violation of trade agreements. The institute for Responsible Technology is currently running a campaign to stop the poliferation of GMO in our food supply, but have we already gotten to the point of no return? The answer (and seeds) are blowing in the wind. :Other country producing commercialized GMO. I was pleasantly surprised to read last week that Oprah Winfrey has “gone Vegan” for a trial period of 21 days. She has been writing about it in her blog. She has been talking a lot about Eckhart Tolle’s new book called A New Earth, and as part of her quest for spiritual enlightenment she has deiced to incorporate a vegan diet into her life. I for one applaud her and I hope she inspires others to follow this example. The idea that vegetarianism is connected to spirituality has been around a very long time. Buddhist are known for this being part of their beliefs. As I interpret it, animals that are bred for food experience a life that is filled with suffering and by eating the flesh of these animals you are also ingesting all the experience, pain, fear, and misery that animal lived. Only someone who does not eat animal products can tell you for sure if by not eating flesh they feel somehow more peaceful. I know personally that I do feel better knowing I do not eat mammals and am very conscious about any animal products that I do use. I believe, like first nations people, that everything has a spirit and I honer the life of any animals that have passed on in order to make my life better. I will be interested to read how this experiment will affect Oprah. She is already a beacon of light and inspiration for millions. Food has been a huge issue for her, as she has publicly acknowledged. I hope she is able to make the connections she is hoping for and this will raise her spiritual awareness even more. If you are interested in finding more information about a plant based diet check out this site. Earth Save was started by John Robbins, son of Baskin Robbins founder.